Joining fellow UC Physicians who work in UCI, UCSF and UCLA Medical Centers, UC Davis Residents and Fellows unite within a union to fight for the best quality patient care and strong workplaces. Sacramento, CA – Following the growing national trend of house staff at hospitals and medical centers voting to unionize, a majority of UC Davis residents, interns and fellows have agreed to unionize and be represented by the Committee of Interns and Residents (CIR), a local of the Service Employees International Union (SEIU). 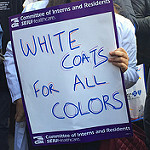 CIR SEIU represents more than 16,000 resident physicians and fellows who are dedicated to improving residency training and education, advancing patient care, and expanding healthcare access for our communities. “The importance of our organizing campaign cannot be understated. We have successfully unionized against a backdrop of ever rising student debt, increased cost of living throughout the Sacramento region, and a healthcare landscape that continues to evolve,” said Dr. Gerardo Canedo, third year resident in the department of Internal Medicine. As California continues to have staggering cost of living rates, in order to attract and retain the best residents and fellows, UC Medical programs must establish funds dedicated to addressing housing, child care and similar living expenses. “At the end of the day, patient care is what ultimately suffers when medical programs are unable to fully staff positions or retain great residents and fellows,” said Dr. Jaire Saunders, second year resident in Physical Medicine & Rehabilitation. In the last year, CIR SEIU resident physicians in Los Angeles county negotiated for paternity leave and a fund for undocumented patients, while UCI residents negotiated a $2,900 increase to their housing stipend in their first contract. The newly formed UC Davis CIR SEIU unit is excited to get to work improving patient care and physician wellbeing.